Whether you're seeking a new career in computers, need to enhance your current career, or want to brush up on your computer skills, we can help you get the training you need. Red Rocks Online students are provided with software, virtual environments and other helpful resources. Courses are always taught using the latest software versions and map to program standards. 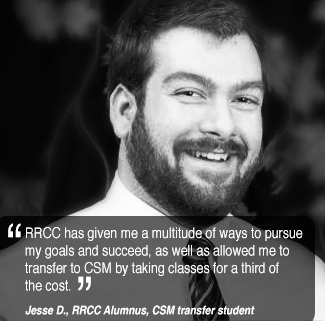 As a Red Rocks student, we want you to be in the RRCC Online course sections! Online Computer Technology courses are available every semester - take a look here. Red Rocks Community College (RRCC) is implementing a Cyber Security Scholarship Program (CSSP) to enroll academically achieving, incoming freshman and current students, as full-time Computer Information Systems (CIS) majors with an emphasis in CyberSecurity Specialist, Programming Specialist, Web Development or Networking Specialist. Get more info on the Cyber Security program here. 2018 scholarship awards will depend on available funds. The new Secure Software Development AAS Degree will be available Fall 2018. Red Rocks Community College is a proud Academy Partner of CompTIA - the voice of Information Technology. Red Rocks Community College is proud to have transfer agreements with some of the best colleges and universities in the state of Colorado. Your AA or AS Degree can transfer to a Colorado public 4-year colleges and universities if you complete your AA or AS degree with a C or better - and then complete the remaining 60 credit hours in a school or arts and sciences at the four-year public institution of your choice. Click here for a list of courses that are guaranteed transfer to any Colorado public college or university. Click here to see the degrees that transfer seamlessly to Colorado public colleges or universities. Also take a look at our transfer guide.